Joshua Cole’s mother spotted a famous face as they were walking to their connecting flight in Hartsfield–Jackson Atlanta International Airport in 2003. Cole said that he was skeptical at first, but walked over to the woman and asked if she was, indeed, Coretta Scott King. She replied, “Why, yes, I am young man, and how are you?” Cole, president of the Stafford County chapter of the NAACP, told the more than 350 people packing the Fredericksburg Hospitality House & Conference Center ballroom for the Dr. Martin Luther King Jr. Prayer Breakfast Monday. Cole, who recently announced that he plans another run for Virginia’s 28th House District, said that it was always exciting for him as a boy growing up in Stafford to hear stories of the late civil rights leader. He was devastated to learn when he was a child that King had been assassinated, and he’d never have the chance to meet him. Cole, the keynote speaker at the Fredericksburg Branch NAACP’s annual event, paused for a round of applause before adding people can’t be complacent and think that the dream of equality that King spoke of 51 years ago in his famous “I Have a Dream” speech has become reality just because some legislation has been passed and an African–American was elected president. “The reality is we have merely placed Band–Aid after Band–Aid after Band–Aid after Band–Aid on a wound that has never healed,” he said. Injustices are still going on across America and the world, from the ongoing government shutdown to illegal immigrant children being separated from their parents to Civil War monuments being preserved in the name of history, said Cole. He reminded them of King’s message that “injustice anywhere is a threat to justice everywhere,” and urged them to continue the fight. 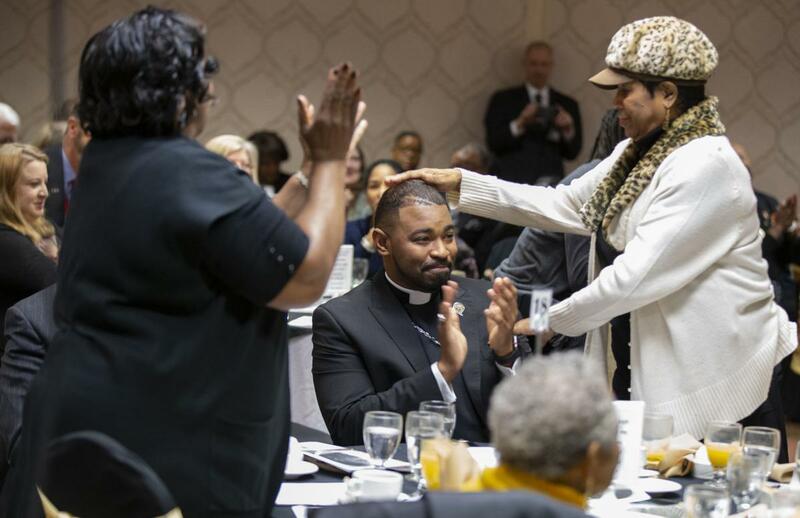 The Fredericksburg Branch NAACP has honored King’s memory with a breakfast program on Martin Luther King Day since 2001, when the Rev. Dr. Nathaniel Young, its president at the time, organized the first one. The program has grown in popularity over the years, and Monday’s was the largest ever, said Charlyne Jackson–Fields, the current Fredericksburg Branch president. Gaye Todd Adegbalola, the branch’s vice president, kicked off the program at 9 a.m. by leading the audience in a rousing rendition of “Woke Up This Morning (With My Mind Stayed on Freedom), a revamp of an old gospel song created during the Freedom Rides. It was one of a number of musical selections featuring Keith Armstead and his ensemble that interspersed prayers, remarks and a salute to artist Johnny P. Johnson and his wife, Jean, recipients of this year’s Martin Luther King Jr. Humanitarian Award, and Brandon Woolridge as the organization’s first Youth Humanitarian Award winner. The Johnsons were outstanding teachers in the Fredericksburg school system from the late 1950s to early 1980s, and provided critical leadership as the city’s schools were integrated, said Xavier Richardson, who presented the awards. Richardson lauded the Johnsons’ dedication to community service and philanthropy, and noted the hundreds of paintings that Johnny Johnson had donated to organizations. In accepting the honor, Johnson said that his interest in civil rights was sparked 65 years ago in his hometown of Henderson, N.C., when a black woman called the police because her mentally ill brother was “acting up.” The police couldn’t get him out of the house, even after tossing in canisters of tear gas. The sheriff deputized a taxi driver at the scene who had a .30–30 rifle, and the taxi driver shot the unarmed man. Henderson was a hotbed of KKK activity at the time, he said, and the taxi driver’s action was deemed legal because he’d been deputized. Johnson said that Mamie Scott, a Fredericksburg teacher, civil rights activist, and Head Start director who died in 2000, convinced him to be a life member of the NAACP when he moved to the city. Woolridge, a James Monroe High School senior and captain of its football team, was inspired to perform random acts of kindness by his late father’s insistence on giving money to the homeless, Richardson said. These have included asking a special needs student to accompany him to the prom, and presenting flowers and candy as surprise Valentine’s Day gifts to the school’s female custodians. His actions helped inspire JMHS students to vote for a special needs student as prom queen. That captured what King was about and why people celebrate his legacy today, he said, but it’s become too easy to look at their differences and it’s more difficult to look at what they have in common.